When released to showrooms this fall and early next year, the two variants, namely the GLA250 4MATIC and GLA250 FWD will expand the automaker’s range of sport utility vehicles to five, including the GLK, ML, GL and G classes. It’s called compact, but at nearly 15 feet long, six feet wide and five feet tall, there’s nothing small about the new Mercedes-Benz model. The GLA impresses mainly with its progressive character and agile handling," says Dr. Joachim Schmidt, Executive Vice President Sales and Marketing Mercedes-Benz Cars. With its distinctive front end focused on the three-pointed star, the GLA is succinctly sculptured like a crossover, with high clearance and muscular wheel arches surrounding standard 18-inch wheels. Chrome roof rails accent the graceful arc of the roofline, leading to a large liftgate with a low loading sill, making the insertion and extraction of gear a breeze. Rear seats fold flat to increase the cargo space immensely, adding as much to the GLA250 4MATIC’s versatility as the fully variable torque distribution of the all-wheel-drive system. "So I am very confident that the GLA, with its fascinating design and high everyday practicality, will fill many new customers with enthusiasm for the Mercedes-Benz brand," added Dr. Schmidt. Other design highlights include a dual louvered grill beneath a powerful hood bulge, centered between headlamp housings that include LED daylight running lights. This element utilizes a new three function fiber-optic system to create a truly unique lighting signature. Simulated skid plates and sill panels help protect the distinctive features from rocks, if the pretty little thing puts on the mountaineering boots and goes bushwhacking. The highlights of the rear trim of the 2015 GLA250 include a curved rear window, sweeping chrome liftgate latch and divided taillights. A large roof spoiler blends into the rear roof trim to secure the eye-level brake light. Optional exterior equipment includes high-gloss black roof rails, an upgrade to 19-inch wheels and a silver-metallic rear skid plate. Like most cars, the sculptured shape of the Mercedes-Benz 2015 GLA250 is part of never-ending efforts to boost efficiency. Modifications to increase the ease with which the compact SUV glides through the air include the shape of the exterior mirror housings, rear end and taillights, plus spoilers on both the rear roofline and sides. Extensive underbody paneling, including the middle of the rear axle, and an optimized rear silencer enhanced by a diffuser, smooth the flow of air beneath the underbody. Seals in the front bumper around the headlamps and radiator complete the vehicles aerodynamic measures, allowing the achievement of up to 37 mpg. A new multi-level door-sealing concept, additional tailgate sealing, rigid window frames and a lowered A-pillar are among the efforts aimed at reducing wind noise and vibration within the GLA. The new MB GLA250 sports a turbo-charged, direct injection, 2.0-liter 4-cylinder engine that outputs 208 hp and 258 lb-ft of torque. It will perform zero-to-60 in 6.4 seconds and has a maximum speed of 145 mph. That should be quite enough to get you to the world on time. The engine is coupled to a 7-speed dual clutch automatic transmission, for sporting yet comfortable performance. So like the old 60s song, you can go where you want to go, do what you want to do and the GLA will provide the transportation. The GLA features a McPherson front axle plus an independent multilink rear suspension. Utilizing three control arms and one trailing arm for each wheel manages longitudinal and lateral forces independently. Aluminum wheel carriers and spring control arms serve to reduce unsprung mass. In the 4MATIC version, the rear axle is isolated via rubber bushings to create a more comfortable ride on rougher terrain. Electromechanical power steering enables the ESP control unit to apply counter-steering when needed and corrections when braking on slippery surfaces, enhancing the FWD model’s performance. It also allows for automatic steering compensation during crosswinds. An all-new generation of the 4MATIC full-time all-wheel drive system is an option on the Mercedes-Benz GLA, with its fully variable torque distribution, providing even more grip and agility, without sacrificing safety or efficiency. The 4MATIC system uses power take-off to the rear axle integrated into the 7-speed dual clutch transmission, plus a rear-axle gear tied to an electro-hydraulically controlled multi-disc clutch. This allows a totally variable distribution of drive torque between front and rear axles on a split-second basis, while weighing less and contributing to higher efficiency. It also features a Downhill Speed Regulation (DSR) system that’s activated by a button on the console, and an off-road transmission mode. Notably the display screen can be switched to show the steering angle, selected off-road transmission mode and a compass. In DSR mode, the degree of roll angle and the gradient in percent are also indicated. Naturally it has all the latest safety, telematics and infotainment features of any luxury vehicle, either standard or as an option. 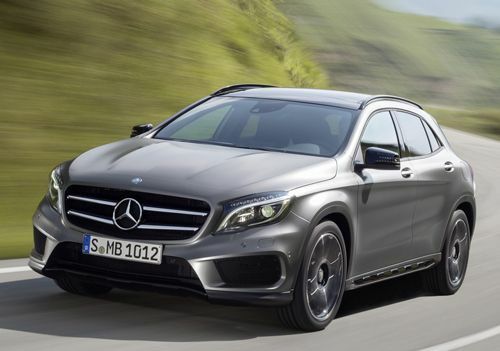 As previously stated, the 2015 Mercedes-Benz GLA350 4MATIC will be at showrooms this fall, while the FWD models will arrive early next spring. No pricing data has been released as of yet.